3-D or stereoscopic cinema presents separate images for the left and right eyes, screening them (with the assistance of eyewear) in a manner that prevents the left eye from seeing the image intended for the right, and vice versa. These images provide subtly different perspectives on a scene, recreating the perception of depth provided by binocular vision when viewed with polarized lenses that separate out the images. Generally speaking, when placed alongside each other these images create a sensation of depth behind the viewing plane, and when placed in an overlapping fashion they seem to extend in front of the viewing plane, these phenomena are known as positive parallax and negative parallax (or emergence) respectively. Historians – and advocates – of 3-D emphasize the existence of this kind of imaging prior to motion pictures. Stephen Prince describes at some length the advancements in stereoscopic image production in the second half of the nineteenth century, detailing the many patented devices for exhibiting stereoscopic images and, later, moving images by filmmakers such as Thomas Edison and the Lumière brothers (202). Sergei Eisenstein stated firmly in 1949 that “mankind has for centuries been moving towards stereoscopic cinema”, clearly seeing it as the teleological culmination of technologies of image representation (qtd. in Lane). While it may be true that stereography “preceded photography”, and that the “impulse to capture life and replicate it with movement, color, sound, and three dimensions was present at the dawn of photography and motion pictures”, the installation of 3-D as a standard format for film entertainment has not yet occurred (Zone 4). The first 3-D feature, The Power of Love, was screened in 1922, but the extent to which this kind of exhibition was commonplace is somewhat debated. Certainly, the first agreed ‘wave’ of 3-D films were released in the early 1950s: the independent stereoscopic release Bwana Devil (with its famous tagline ‘A lion in your lap! A lover in your arms!’) performed surprisingly well in November 1952. Hollywood, seizing an opportunity to make cinema special again in a time when it was threatened by newly affordable television sets, quickly “embarked on a year long flurry of 3-D production” (Mitchell 208). Richard C. Hawkins, in an article from 1953, describes the “entire motion-picture industry” as being “in a state of revolution” at this time, akin to the mainstream application of synchronized sound in 1927 (325). However, despite even Alfred Hitchcock filming in the format (Dial M for Murder (1954)), box office returns did not justify the problems encountered when using the technology. To entice viewers away from their domestic entertainments the film industry instead looked to widescreen and Technicolor processes, which soon became standardized in a way 3-D did not. In the 1980s once again home entertainment systems are retrospectively seen as driving technological change in film exhibition. Whether Comin at Ya! 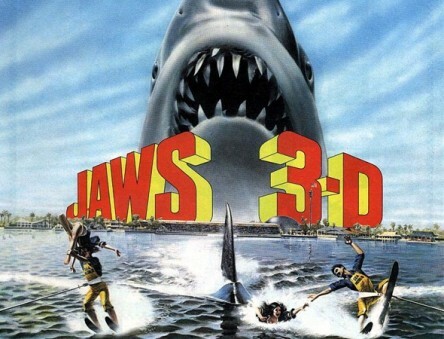 (1981), Friday the 13th Part III (1981) or Jaws 3-D (1983) were released in 3-D as a direct result of the boom in VCRs is open to debate, but certainly this ‘wave’ was also short-lived. 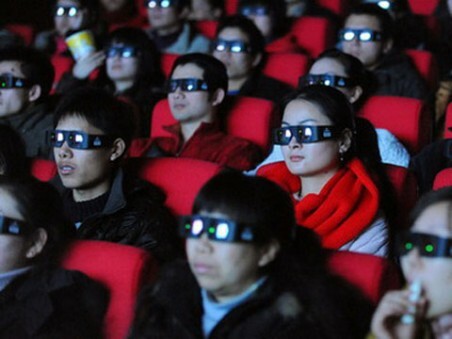 In the early twenty-first century stereoscopic IMAX documentaries (such as Ghosts of the Abyss (2003)) and animated children’s films (The Polar Express (2004), Chicken Little (2005)) cornered what small market share there was to be found in 3-D exhibition. Yet contemporary 3-D’s kinship with digital technology led to it returning to the mainstream. From the mid- to late-1990s industry filmmakers began pushing for digital exhibition to become the standard method of screening films. The increasing ubiquity of digital techniques at every stage of production both prompted and made this possible (Belton 187). 3-D, made considerably smoother with the application of digital technology, once again became part of a strategy to revitalize the cinema experience, rescuing it from the threat posed by pirated Internet content, advanced home entertainment systems and film subscription services (which include instant streaming capabilities) such as LoveFilm and Netflix (Elseasser 219). One of the most successful Hollywood directors of the last few decades, James Cameron, became prophet and marketing manager of digital 3-D, the release of his quarter-million dollar blockbuster Avatar in late 2009 requiring many cinemas to upgrade to digital projection in order to screen the stereoscopic version of the film (Elsaesser 222–223). Thanks to the positioning of Avatar a major cultural event, audiences attended these 3-D screenings in huge numbers, resulting in box office receipts close to $3 billion dollars – a record (see Gray). The further financial success of Alice in Wonderland entrenched digital 3-D as the standard medium for the exhibition of costly, special effects-heavy blockbusters. This was despite hostile critical accounts of the stereoscopy in Tim Burton’s film, which was generated in post-production (see Burr, Stevens). The continued tendency to convert – Marvel has converted all their content to 3-D since Thor (2011) – indicates both the extent to which 3-D remains an ‘event’, and the potential profitability of a stereoscopic release thanks to its additional ticket surcharges. A notable failure in this area was Clash of the Titans (2010), hurriedly converted following Avatar’s success, and which critic David Edelstein states looks like a “pop-up greeting card.” These complaints become less frequent as the process of conversion becomes more sophisticated. Industry practitioners insist that “quality defects” arise due to “lack of attention or scrutiny to some phase of the [conversion] process”, not to its fundamental unworkability (DeJohn). This process is complicated, time-consuming and costly. Titanic (1997), re-released in 3-D in 2012, took sixty weeks and $18 million to convert, for example (Murphy). This is not just due to the technological burden, but also creative labour – as Cameron states in an interview, conversion “really boils down to a human, in the loop, sitting and watching a screen, saying, ‘O.K., this guy is closer than that guy, this table is in front of that chair’, and so on” (qtd. in Itzkoff). This subjective interpretation of spatial qualities is even applicable to ‘native’ 3-D, as both on-set and in post-production extensive work is required to adapt and manipulate z-axis information in order to make it legible, coherent and artistically expressive (Prince 214). This expressiveness has been the subject of a great deal of critical attention subsequent to the popularization of digital 3-D after 2009, whereas previously it was often sidelined. For instance, writing on previous 3-D waves, especially the 1950s, William Paul and Philip Sandifer are indicative of criticism in their attention to the emergence effect (moments when objects are thrust into the theatre in a combative manner). For Sandifer, these shots make the conditions of film spectatorship “conspicuously visible”, taking the viewer out of the narrative world of the film: “to marvel at an immersive technology is necessarily not to be immersed” (69, 64). The 3-D in films like Bwana Devil “constantly foregrounds itself, often in the most literal fashion” (Paul 229). This ruptures “dramatic flow” – a sensation briefly pleasurable, but ultimately unsatisfying (Lane). Both Sandifer and Paul conclude that these spectacular aspects make 3-D resistant to absorption into filmic convention, therefore condemning it to appear in ‘waves’ which do not last more than a few years. Similar, if more extreme, positions are taken by Roger Ebert (2010, 2011) and Mark Kermode (2011), who have both been outwardly hostile towards 3-D. John Belton suggests definitively that “if 3D is to be 3D, it must necessarily exploit the phenomenon of emergence, violating the segregation of spaces that lies at the core of the experience of classical cinema” (194). All these writers perceive a crucial disunity between 3-D technology and classical film style. However, the longevity of the current crop of 3-D releases can be attributed to their more nuanced approach to depth composition than Sandifer, Paul and Belton allow. Use of the z-axis is orchestrated “across the narrative arc of [a] film in ways that creatively engage (and don’t exhaust) the viewer’s attention and image-fusion capabilities and that also embod[ies] important attributes of narrative and dramatic meaning” (Prince 214). 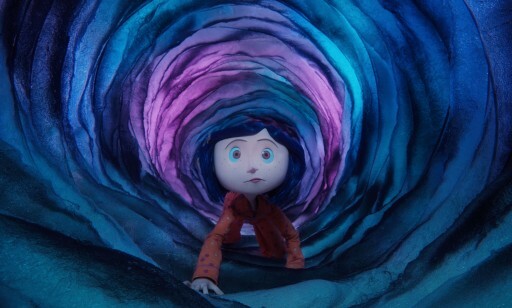 Coraline (2009) is often cited as successful in this regard, and Scott Higgins provides a valuable reading of the film’s depth strategies as they relate to the heroine’s feelings of claustrophobia, threat and wonder (196). As Elseasser states, contemporary 3-D exists within a digital mediascape, conditions radically different to those of the 1950s or 1980s. He suggests that in today’s films (if not in their marketing) 3-D aims to be invisible, rather than visible: ‘That is, much of the effort of directors, designers, and draftspersons working in 3-D goes towards naturalizing this type of technologically produced spatial vision, making it increasingly indiscernible’ (221). As Cameron himself asserts, “The technology should wave its own wand and make itself disappear” (qtd. in Lane). This is perhaps a paradoxical claim for an exhibition medium that requires upgraded projection systems, viewer prostheses, and higher ticket prices. Without doubt digital 3-D has proved more resilient than previous applications of the technology, and the Oscars awarded to the 3-D cinematography of Hugo (2011) and Life of Pi (2012) further demonstrate the critical recognition of the aesthetic possibilities of the stereoscopic medium. Rather than being a gimmick relying upon the emergence effect and shock value, contemporary stereoscopic films have benefitted from an increasing industrial knowledge base and rising audience familiarity. As more 3-D films are made, it might be expected their use of the medium will become increasingly nuanced. Critical accounts of such aesthetic strategies will likewise require new tools and approaches for their analysis. These tools will need to take into account both the illusionistic and the immersive qualities of 3-D: the uncanny potential it has to be both real and fantastical, a potential that encourages filmmakers to connect it to the early days of cinema itself, as in the film history narrative of Hugo and the kinetiscope-finale of Oz the Great and Powerful (2013). 3-D may be a cynical ploy to increase ticket prices and thwart (some) piracy, but it can also be an expressive tool for talented filmmakers. As Wim Wenders, whose 3-D documentary Pina (2010) was a critical success, states, stereoscopy belongs in the hands of “people willing and able to forget limits, rules, formulas, recipes, and enter a whole new age of cinema, where there is more … connection. Existential connection. Believe it or not, 3D has that connecting power” (qtd. in Pennington and Giardina 7, ellipsis in original). Belton, John. “Digital 3D Cinema: Digital Cinema’s Missing Novelty Phase.” Film History 24.2 (2012). 187–195. Print. Burr, Ty. “Review: Alice in Wonderland.” Boston Globe, 5 Mar 2010. Web. 14 Mar 2013. DeJohn, Matthew. “How to Critique 3D.” Digital Cinema Report, n.d. Web. 14 Mar 2013. Ebert, Roger. “Why I Hate 3D (And You Should Too).” The Daily Beast (Newsweek), 09 May 2010. Web. 14 Mar 2013. Ebert, Roger. “Why 3D doesn’t work and never will. Case closed.” Chicago Sun Times, 23 Jan 2011. Web. 14 Mar 2013. Edelstein, David. “Clash of the Titans Review.” New York Magazine. 2 Apr 2010. Web. 15 Mar 2013. Elseasser, Thomas. “The ‘Return’ of 3-D: On Some of the Logics and Genealogies of the Image in the Twenty-First Century.” Critical Inquiry 39.2 (2013). 217–246. Print. Gray, Brandon. “’Avatar’ Claims Highest Gross of All Time.” Box Office Mojo, 3 Feb 2010. Web. 14 Mar 2013. Hawkins, Richard C. “Perspective on ‘3-D’.” The Quarterly of Film Radio and Television 7.4 (1953). 325–334. Print. Higgins, Scott. “3D in Depth: Coraline, Hugo, and a Sustainable Aesthetic.” Film History 24.2 (2012). 196–209. Print. Itzkoff, Dave. “Eye-Popping for Art’s Sake: An Advocate for 3-D Films [interview with James Cameron].” New York Times, 20 Oct 2010. Web. 22 Feb 2012. Kermode, Mark. The Good, The Bad and the Multiplex. London: Random House, 2011. Print. Lane, Anthony. “Third Way: The Rise of 3-D.” The New Yorker, 8 Mar 2010. Web. 25 Sep 2012. Murphy, Mekado. “Inside the 3-D Conversion of ‘Titanic’” New York Times, 30 Mar 2012. Web. 14 Mar 2013. Paul, William. “Breaking the Fourth Wall: ‘Belascoism’, Modernism, and a 3-D Kiss Me Kate.” Film History 16.3 (2004). 229–242. Print. Pennington, Adrian and Carolyn Giardina. Exploring 3D: The New Grammar of Stereoscopic Filmmaking. Focal Press: Oxford, 2012. Print. Prince, Stephen. Digital Visual Effects in Cinema: The Seduction of Reality. New Jersey: Rutgers University Press, 2012. Print. Sandifer, Philip. “Out of the Screen and into the Theater: 3-D Film as Demo” in Cinema Journal 50.3 (2011). 62–78. Print. Stevens, Dana. “Review: Alice in Wonderland.” Slate, 4 Mar 2010. Web. 14 Mar 2013. Zone, Ray. Stereoscopic Cinema and the Origins of 3-D Film, 1838 – 1952. Lexington: University Press of Kentucky, 2007. Print.